Americans Say Security Checks Are A Bigger Health Concern Than Flights : Shots - Health News More than 1 in 5 respondents said they would refuse to be examined in one of the whole-body scanners now in many airports. A third of people under 35 said they would decline the scans. 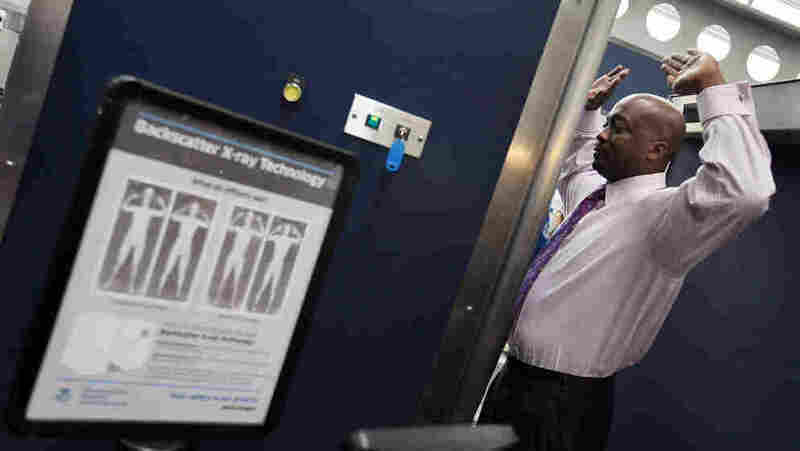 A Transportation Security Administration volunteer demonstrates a full-body scanner at Chicago's O'Hare International Airport in March 2010. If you're heading for the airport humming I'll Be Home For Christmas, all of us at Shots hope your trip goes without a hitch. With all the comings and goings of the holiday season on our minds, we recently asked Americans a few questions and air travel and health. And the latest NPR-Thomson Reuters Health Poll finds that when it comes to flying, the vast majority of American don't have a care about health once they're in the air. Only 8 percent said they had any health worries about traveling by plane; 92 percent don't think twice. What's the biggest personal risk from being airborne? Twenty-one percent cited the ultimate health risk: a crash. Sixteen percent said it was catching a cold or the flu. About 7 percent said it was anxiety. Only 5 percent said developing a blood clot, which has been recognized as a problem for sedentary travelers on long-haul flights. We wondered if anyone thought flying had ever led them to become ill, and 11 percent said they thought it had. Now what about the security screening that goes on before the plane takes off? More than 1 in 5 respondents (23 percent) said they would refuse to be examined in one of the whole-body scanners now in many airports. A third of people under 35 said they would decline the scans. About 23 percent of poll respondents said they were concerned about radiation exposure from the scans. Invasion of privacy bothered 17 percent, and 13 percent object to the scans because they consider them to be an unreasonable search. The risk from radiation exposure from the security checks is scant, said Dr. Ray Fabius, chief medical officer for the health care unit of Thomson Reuters. "The much more serious health concerns associated with flying are exposure to communicable illnesses and blood clots during long air excursions," he said. "By avoiding traveling when sick and exercising in your seat, these risks can be minimized." The telephone poll of more than 3,000 adults across the country was conducted during the first half of November. The margin for error is plus or minus 1.8 percentage points. Click here to read the questions and complete results. You can find the previous polls here, or by clicking on the NPR-Thomson Reuters Health Poll tag below.